Vicksburg I’ve read a couple of Nicholas Kristof’s books with interest over the years and used to read his column in the New York Times, but largely have abandoned them in recent years as I’ve done more international organizing. I’ve done so not because he’s exactly wrong on the issues, but it’s a matter of taste and he’s become too sanctimonious for me and too rah-rah about this and that, all of which I have come to find annoying in a way that doesn’t make we want to carry a sign, but does have me skip over his column. 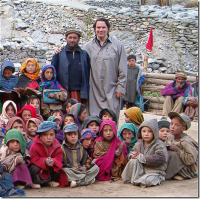 I say all that not by way of apology, but grudging admiration for an extremely fair and balanced, yet nuanced and supportive column he did this week about Greg Mortenson, the author of Three Cups of Tea, and promoter and sometimes builder of schools in Afghanistan. I don’t know Mortenson from Adam, haven’t read the books, and don’t plan on doing so, though of course I’ve read about his work and followed the broad outlines of his efforts. In short I don’t have a horse in this race. Jon Krakauer, another author and another guy with experience on the mountains, and 60 Minutes do have some beef with Mortenson and his work, and seem to have poked some large gaping holes in it including the fact that almost 60% of the money didn’t go to building schools in the last report from 2009, and that a lot of the schools don’t exist. They clearly have horses in the race, and Krakauer who has gone after the Mormons without blinking an eye, and 60 Minutes are not folks who you would choose to have on your bad side. Instinctively, having also read most, if not all, of Krakauer’s books, I would go with his view in a minute over almost any other protestation, so I’m betting Mortenson has real troubles that have now come to the surface fairly. Kristof also has a fast running horse in this race having promoted in his usual enthusiastic way Mortenson and counts him as a friend and calls himself a fan. Fair enough. The last line is the kicker. It is a “walk a mile in my shoes” sentiment that has real value. Essentially, he concedes the dude may have messed up, but that doesn’t change the record – he still built schools and created change for children – or the fact that the “reader” and most of the biscuit cookers out there who might stand in judgment haven’t done diddle. In the “gotcha” culture of modern politics and the court of public opinion which has created so many couch potato hanging judges, Kristof makes a contribution for his friend here by reminding people that it’s a messy world and there are messy people in it, but it’s worth the work warts and all. Kristof’s plea for mercy here should be remembered when we look at many people and the imperfect but beautiful work of social change. This entry was posted in Ideas and Issues and tagged Afghanistan, Greg Mortenson, Jon Krakauer, Nicholas Kristof, schools, social change, Three Cups of Tea by wade. Bookmark the permalink.